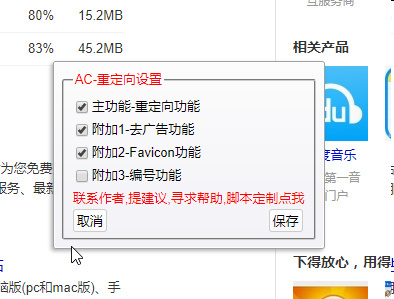 【GM脚本】[03月29日]AC-干掉百度谷歌搜狗重定向~真的不是卖萌_Firefox_浏览器讨论区 卡饭论坛 - 互助分享 - 大气谦和! Powered by Discuz! X3.4( 苏ICP备07004770号 ) GMT+8, 2019-4-19 22:50 , Processed in 0.047998 second(s), 4 queries , MemCache On.